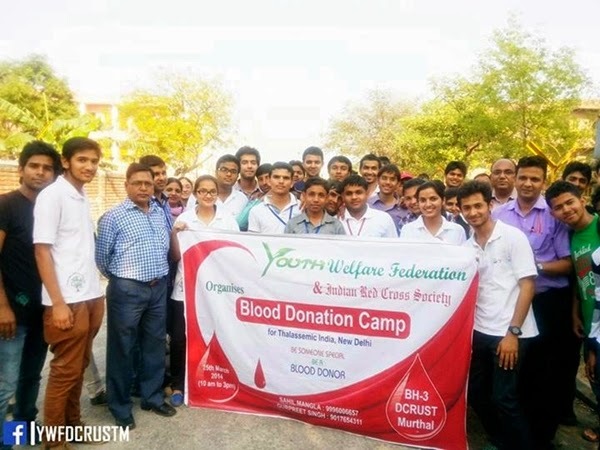 Youth Welfare Federation & Indian Red Cross Society organized a blood donation camp for Thalassemic India, New Delhi on 25th March 2014. By far this is one of the biggest events organized by Youth Welfare Federation. Large number of people were rejected because of low weight, low HB & other conditions, still we made it. We hope the rejected ones will appear next time with full health. We achieved our target. Red Cross staff was very happy to see the passion among students to help Thalassemia patients. They thanked YWF for maintaining the decorum throughout the day & showed their desire to conduct such camp in DCRUST every year if possible.